Malibu Treatment for Swimmers | Kids' Hair Inc.
Is your child’s hair feeling dry, brittle, sticky, tangled or even has a straw-like shine to it or is slightly green? These all could be signs of chlorine damage. 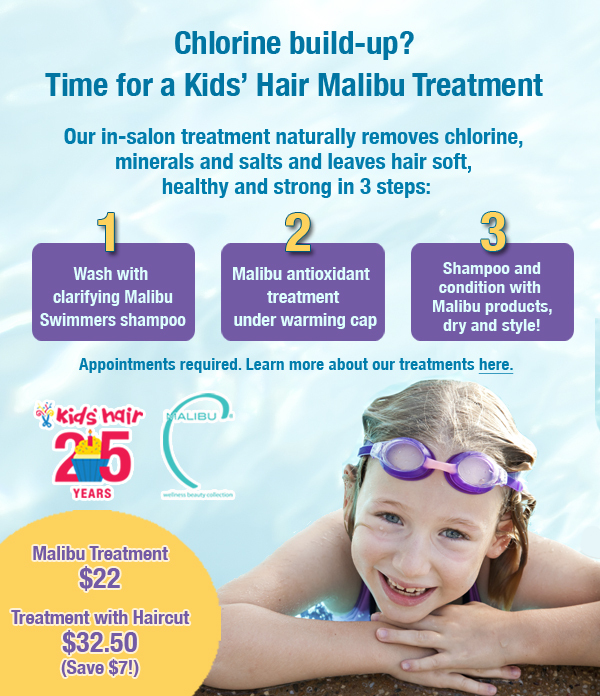 Kids’ Hair offers an in-salon Malibu Treatment to naturally removes chlorine, minerals and salts. Who needs a Malibu Treatment? For kids who swim multiple times a week, a Malibu Treatment once a month can really help reverse and prevent damage. For the casual summer swimmer, getting a treatment before back-to-school is a great way to ensure healthy, soft hair and restore moisture before the fall dry air and wind makes dealing with snarls and tangles even more difficult. The treatment process takes 30-45 minutes and starts with a shampoo with Malibu’s Swimmers Wellness and the application of Malibu’s swimmer’s treatment product. Next your child watches a movie at one of our stations with a heat processing cap on for 15-30 minutes depending on their hair thickness and extent of chlorine damage. Finally, the stylist extracts all the build-up and minerals that have been pulled out from the treatment, shampoos and conditions with Malibu products, dries and styles the hair to go! Don’t swim but have dry hair? For kids who don’t swim but are still dealing with dry or easily tangled hair from playing outdoors and summer sports, Kids’ Hair has a Conditioning Treatment, an in-salon “Miracle Repair” treatment similar to the Malibu treatment process but for hair damaged or dry from other influences than chlorine. The treatment restores strength, shine and moisture, repairing the damage from sun and wind and making hair much more manageable and healthy looking. A Malibu or Conditioning Treatment is $22.00. A treatment and haircut combo is only $32.50 (Save $7.00!). Appointments are required due to the treatment time taking 30-45 minutes. Click here for a list of our locations’ phone numbers to make your appointment now or to learn even more about our treatments.